Mandarina Colombo, the 80-room business hotel owned and managed by Macksons Properties Ltd., won the real estate industry’s highest honour when it clinched the Best Hotel Development Award 2018. 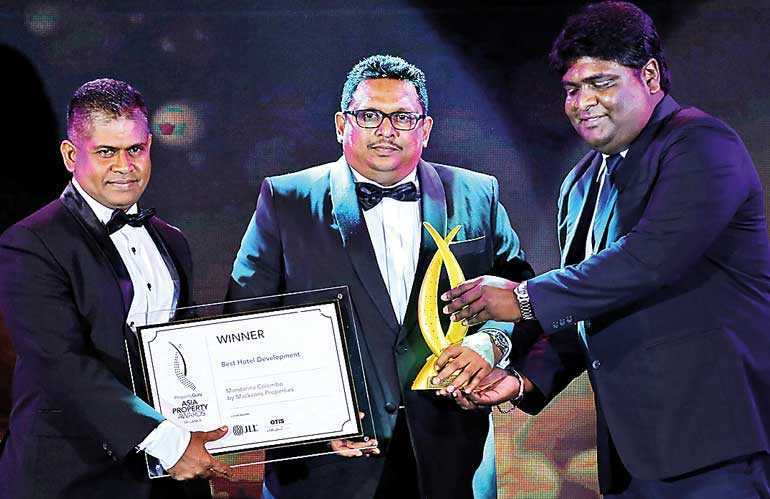 The annual Asia Property Awards was held for the first time in Sri Lanka recently at a spectacular event to recognise and reward the country’s best real estate companies and projects. For Mandarina Colombo which opened barely 18 months ago in 2017, the award is a coveted benchmark of excellence rewarding only the best developers and developments in Asian real estate at a domestic and regional level. Mandarina Colombo is strategically located in Kollupitiya along Galle Road and has 11 floors with rooms that include comforts and features ranging from High Speed Wi-Fi to 24-hour medical assistance on request. The newest additions to its list of services are banqueting and meeting room facilities. A distinctive feature of the hotel is the glass fronted infinity swimming pool on the rooftop, offering a view of both the city’s rising skyline and the sweeping Indian Ocean.